In the past year, an energy dispute for the ages has played out in Canada, culminating in the federal government announcing that it will buy an aging oil pipeline for $4.5 billion and then twin it with a new high-capacity pipeline that would move massive amounts of diluted bitumen from Alberta to tidewater in British Columbia. Prime Minister Justin Trudeau’s vow that “we’re going to get that pipeline built” has been music to the ears of Alberta Premier Rachel Notley, but has struck a discordant note with BC Premier John Horgan, who continues to oppose the project on the grounds that a tanker spill would cause irreparable harm to Canada’s west coast and to BC’s coastal economy. There is a deep irony at play in the high drama we are witnessing: heavy oil production in Canada’s petro province of Alberta is powered, in part, by a glut of cheap natural gas in North America, which gas producers in BC have helped to create. BC is also helping to prop up Alberta’s oil industry by shipping it lots of extremely valuable “gas liquids”— by-products of natural gas which are essential to dilute heavy oil or bitumen so that it can move more readily through pipelines. Much of that out-of-sight, out-of-mind energy flow is also, paradoxically, heavily subsidized by the BC government. Once again, it barely rates a mention in the mainstream press. 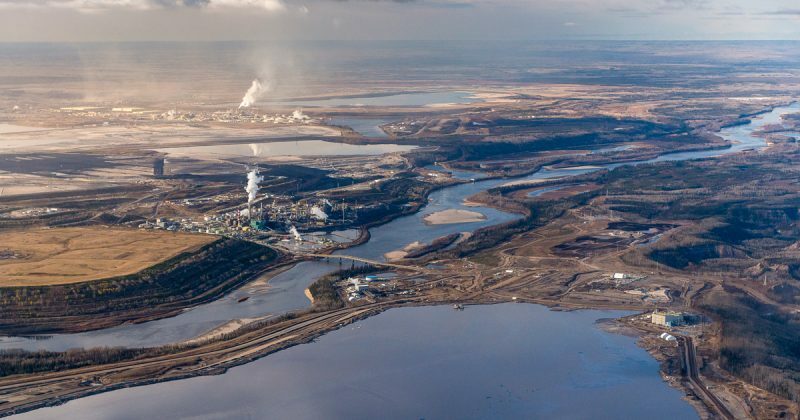 In the last 10 years, BC has effectively become a preferred supplier to its neighbour, the oil sands powerhouse just to the east: a reality with grim implications for the environment and economy in Canada’s two westernmost provinces, to say nothing of our global climate. Alberta’s oil sands industry is the top consumer of natural gas in Canada, accounting for one quarter of all the natural gas used in the country. Much of that gas is combusted to generate steam that is pumped below ground, to “liberate” the thick oil. As oil sands operations expand, more natural gas must be consumed. It is to the industry’s benefit to see lots and lots of natural gas produced from whatever quarter, and of even greater benefit to the industry if increased gas production results in a glut of marketable gas, which keeps prices low. In the ten years ending in 2017, Alberta-bound shipments of natural gas from northeast BC increased by more than 230 per cent. In fact, virtually all of the sizeable increase in BC’s overall gas production went to its neighbour to the east. Some of that gas was used in Alberta; the majority then moved farther east to markets in central Canada and the United States. Contrary to BC Energy Minister Michelle Mungall’s frankly embarrassing assertions that continued natural gas drilling and fracking is necessary so that British Columbians can bask in the warmth of their gas fireplaces, and so those lucky enough to afford it can cook salmon on their gas barbecues, the overwhelming amount of natural gas drilled and fracked from the ground in northeast BC goes to others. It is not used in this province. If the pilot lights ever wink out in the fireplaces in British Columbians’ homes, it won’t be because of BC’s own natural gas consumption, but rather the province’s subsidized gas production (the biggest subsidy of which is the extremely generous breaks on gas royalty payments that the BC government grants natural gas producers in the province). The big user of all the wet gas that BC produces? You guessed it. Alberta’s heavy oil industry. Last year, according to BC’s Ministry of Energy, Mines and Petroleum Resources, BC produced a record 19.7 million barrels of condensate, slightly more than one fifth of Alberta’s production. Without BC, Alberta’s oil sands producers would have had to ramp up condensate shipments from the US to make up the difference. But here’s where the irony of the BC government’s objection to the Trans Mountain project grows even thicker. Like all of that Alberta-bound natural gas, the lucrative gas liquids heading to Alberta are used to prop up the petro province’s heavy oil industry. They are essential in allowing thick, unrefined Alberta oil and bitumen to move through pipelines. Paradoxically, BC’s eastern-bound gas liquids could one day facilitate the westward movement of diluted bitumen through that new pipeline that Ottawa and Alberta are so intent on building. For years, the BC government has encouraged fossil fuel companies to produce more natural gas and liquids by offering generous discounts on the royalties that companies pay to British Columbians on each unit of gas produced. The end result is billions fewer dollars flowing into provincial coffers and from there into public programs like health and education. In the last ten years, according to figures supplied by Cathy Mou, markets analysis manager for BC’s Energy Ministry, the difference between the gross royalty charges to companies drilling for natural gas and gas liquids in northeast BC versus the net royalty payments they actually made was close to a combined $5 billion. A significant factor behind those reduced payments were the above-mentioned credits. Just how much individual companies have benefited from those subsidies, however, is something that the BC government keeps secret. In March, the BC government formalized this secrecy by appending a new “confidentiality” provision to an amended Petroleum and Natural Gas Act. The amended Act, Ministry of Finance officials now claim, expressly forbids them from disclosing such information. Mungall scrupulously avoided responding to Weaver’s questions regarding the forest industry, which was a notable omission. Notable because any member of the public with a little know-how can use a database maintained by the provincial government and free to users to learn precisely how much timber is logged by individual companies in BC and what those companies pay to the Province in return. In other words, members of the public are entitled to know what logging companies pay in stumpage fees (essentially a royalty payment for a publicly owned resource) but they are not entitled to know what fossil fuel companies pay in natural gas royalties. BC’s generous trade in natural gas and wet gases with Alberta carries with it enormous ecological costs, almost all of which are borne by Indigenous and non-Indigenous communities located in the northeast region. This includes stunning and repeated violations of provincial laws, for example fossil companies building dozens of unlicensed dams to trap water for use in their increasingly intense fracking operations—dams built under the watch of the fossil fuel industry’s own dedicated regulator—the BC Oil and Gas Commission (OGC). And it also includes disturbing evidence of massive amounts of methane leaking into the atmosphere at numerous gas well sites and wreaking climatic havoc. Given this, it is entirely conceivable that if the day ever came when a major liquefied natural gas (LNG) facility—or more to the point, a liquefied fracked gas (LFG) plant—was built in BC, the greenhouse gas emissions associated with that gas would put it on par with coal. These are the consequences of BC adding to the temporary glut of natural gas on the North American market and producing more and more gas liquids for use in Alberta’s oil sands industry. More consequences will almost certainly become apparent as increased gas drilling and fracking occurs in northeast BC, and the fossil fuels produced head east. In 2008, fossil fuel companies operating in northeast BC produced 27.4 billion cubic metres of marketable gas. A decade later that production, fueled largely by advances in shale gas drilling and fracking, stood at nearly 48 billion cubic metres. That production, however, is poised to skyrocket. In 2016, Encana drilled 17 wells in northeast BC. One year later, the number of wells drilled hit 107. “Natural gas production from the Montney play straddling Alberta and BC hit a record high in 2017, but the best economics in the fairway come from higher value condensate, and that’s what’s going to drive more ‘focused activity levels’ this year,” the industry watchdog JWN Energy Group reported in January of this year in an article that featured a photograph of a giant drilling rig at an Encana operation in the Montney. The same JWN report noted that companies operating in the Montney were likely to benefit from high condensate prices in the coming year. The high prices, combined with the Montney Basin’s proximity to Alberta’s oil sands producers meant that the “operating netbacks,” or net profits, on each barrel of condensate sold would be in the range of $53. At least part of the reason for those healthy profits are the low royalties that companies like Encana pay to the BC government as they draw gas and gas liquids from the ground in their fracking operations. The big winners in that are the companies that produce and sell the condensate and pentane to the oil sands industry, particularly those companies that drill and frack in liquids-rich zones close to where the oil sands industry operates. Because the Montney Basin is relatively close to where the oil sands industry operates, the costs to ship liquids from BC to Alberta are far lower than the costs of moving the same product into Alberta from the United States. Lower shipping costs thus translate into increased profits for liquids producers in Alberta and BC alike. As more gas wells are drilled in northeast BC to coax more valuable liquids from the ground, something else is happening. More and more natural gas is being produced as well. You can’t have one without the other. A glut of available natural gas now and in the foreseeable future is music to the ears of oil sands producers, says Bill Gwozd, a veteran, Alberta-based natural gas analyst and consultant. “If you’re a big, big oil sands producer and you’re buying gas for your operation, cheap gas is good,” Gwozd said in March when interviewed for an article in the Calgary Herald. With drilling activity increasingly targeting liquids-rich formations, Gwozd said it is reasonable to expect that even more natural gas will be produced, again to the advantage of the tar sands industry. But the expanding pool of natural gas also means that unease is growing among companies that produce mostly natural gas and that see depressed prices for their product for a long time to come. Like their counterparts in the oil sands industry who are anxious to see a pipeline built to carry diluted bitumen from Alberta to tidewater in Burnaby, a growing number of gas producers are anxious to get their “land-locked” product to the west coast as well. Translation? Another east-to-west pipeline, but one carrying natural gas from the Montney to tidewater in Kitimat. Gwozd is at the forefront of efforts, now, to create a new industry association dedicated to increasing the financial returns to companies that produce natural gas and gas liquids in BC and Alberta. Among the big names considering joining CGLM is Chevron. Chevron could become a partner in the LNG Canada project that Shell would lead. Progress Energy, a subsidiary of Malaysian state-owned Petronas, is also the single-largest subsurface rights holder of natural gas assets in northeast BC. It, too, would be a partner should the LNG Canada project proceed. All of which means that one day BC might have a whole bunch of daddies. One daddy just to the east who continues to benefit from a glut of cheap natural gas on the market and who will take all the highly sought-after gas liquids that BC can give. And, if Justin Trudeau and Rachel Notley have their way, another daddy or two at points yet to be determined, if and when diluted bitumen one day moves through a new pipeline to Burnaby—bitumen enabled in part by a whole bunch of natural gas liquids produced in BC.